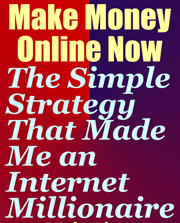 As I don't believe in theories and opinions, I've tested dozens of ways and strategies of making money online. Some proved to be successful while others bombed (and served me well as learning experiences). Now look, 99% of the folks who try to make it on the Internet follow the same rout, the same set of activities. They all move in one big herd. Listen, In the highly competitive online arena, when you do the same things as anyone else you don't stand a chance to succeed - you are doomed. Are you ready to make loads of money online now?